SpaceX is readying a previously flown Falcon 9 booster and an equally "used" Dragon cargo ship for launch Wednesday, one day later than planned, on a flight to deliver 4,800 pounds of equipment and supplies to the International Space Station. It will be the California rocket builder's 17th flight so far this year. The launching will mark the fourth time SpaceX has reflown a recovered Falcon 9 first stage -- a first for NASA -- and the second time the California rocket builder has re-launched a Dragon supply ship. Kirk Shireman, space station program manager at the Johnson Space Center, said the agency conducted an exhaustive review and concluded the Falcon 9 first stage, which helped launch another station supply mission this past June, is just as safe as a brand new rocket. "We're very comfortable that the risk posture on this vehicle is not significantly greater than a new booster," he told reporters Monday. "Some risks are actually less on a reflown booster and some risks are a little greater. The net result is about equivalent risk." 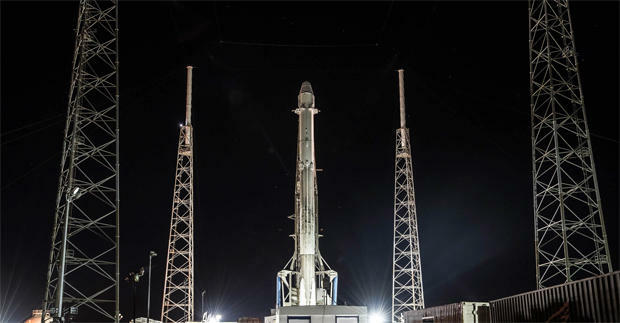 The Falcon 9, sporting a new second stage and a Dragon cargo ship that delivered supplies to the International Space Station in 2015, is scheduled for launch from pad 40 at the Cape Canaveral Air Force Station at 11:34 a.m. EST Wednesday. Forecasters are predicting an 80 percent chance of favorable weather. Launch had been expected Tuesday, but late Monday SpaceX announced a 24-hour delay "to allow for additional time for pre-launch ground systems checks." This will be the first launch off complex 40 since a Falcon 9 exploded on the pad during a pre-flight test on Sept. 1, 2016, destroying the rocket and its satellite payload and heavily damaging the firing stand. With pad 40 out of action, SpaceX launched 16 Falcon 9 missions, 12 from pad 39A at the nearby Kennedy Space Center and four from Vandenberg Air Force Base, California. But SpaceX needs all of its pads to meet the company's ambitious launch schedule. Jessica Jensen, manager of Dragon operations for SpaceX, said the rebuilt pad 40 at the Cape Canaveral Air Force Station is much improved over the original. "Instead of just rebuilding the pad as it was, we wanted to modernize it," she said. "Basically, we wanted to take a 10-year-old pad and make it high tech." The rebuilt pad now features more sensors and "a lot more computer control," she said. "What that means is we have ... a much more reliable pad for safer missions." Given the 24-hour launch delay, the Dragon will reach the space station early Saturday, pulling up to within about 30 feet and standing by while astronauts operating the station's robot arm lock onto a grapple fixture. From there, the cargo ship will be pulled in for berthing at the Earth-facing port of the station's forward Harmony module. Packed in the capsule's pressurized compartment: nearly 1,000 pounds of crew supplies, nearly 2,900 pounds of science material, spacewalk equipment, space station hardware and computer components. Among the experiments is one sponsored by beer-giant Budweiser to learn more about how microgravity affects barley seeds. Mounted in an unpressurized "trunk" section are two external science packages, one to measure how much solar radiation Earth receives and another to help characterize the space debris environment. The Dragon berthing will come two days after three station crew members, Soyuz MS-05 commander Sergey Ryazanskiy, flight engineer Randy Bresnik and Italian astronaut Paolo Nespoli, return to Earth with a landing on the steppe of Kazakhstan around 3:38 a.m. EST to close out a 139-day mission. One day after the Dragon's berthing, at 2:21 a.m. EST Sunday, three fresh crew members -- Soyuz MS-07 commander Anton Shkaplerov, flight engineer Scott Tingle and Japanese physician-astronaut Norishige Kanai -- are scheduled for launch from the Baikonur Cosmodrome in Kazakhstan. After a two-day 34-orbit rendezvous, Shkaplerov and his crewmates plan to dock at the station's Rassvet module early Tuesday, Dec. 19, joining Expedition 54 commander Alexander Misurkin, Mark Vande Hei and Joe Acaba, who arrived at the space station in September. The SpaceX launch and the Soyuz crew rotation flights will cap a busy end-of-year schedule for NASA with an equally busy year on tap in 2018. "Research will be ongoing hot and heavy with the SpaceX 13 Dragon mission," Shireman said. "We have two spacewalks planned for January ... we have three (Russian Progress cargo ships), four Soyuzes, we have a number of SpaceX Dragon and Cygnus flights and in addition, we'll be preparing on orbit for commercial crew flights. So really, 2018 (is) a very pivotal year." But first up is the Falcon 9 and SpaceX's 13th operational space station resupply mission. SpaceX holds contacts valued at more than $2 billion for 20 space station resupply flights, a subsequent contract covering another six cargo missions and a $2.6 billion contract with the space agency to build and launch a piloted version of its Dragon capsule to ferry astronauts to and from the lab complex. Jensen said no new Dragon cargo ships will be needed to complete the current 20-flight resupply contract and that re-flying boosters is a key element in SpaceX founder Elon Musk's long-range plan to lower launch costs by recovering, refurbishing and re-launching booster components. The NASA flight, using a previously flown first stage and Dragon cargo ship, marks "the beginning of rapid and reliable reusability," she said. "Even though we're spending a lot of time now doing additional testing on hardware, additional inspections, working very closely with NASA, in the long run, reusability is going to significantly reduce the cost of access to space. "And that is what is going to be required to send future generations to explore the universe. We want to send thousands of people into space, not just tens. Reusability is a very key part of that. (Tuesday's launch) is just one step closer to that."